Thomas Sankara became the president of Burkina Faso, the then Upper Volta in 1983 after leading a coup that saw him take the presidential seat. He seized power at the age of 33, his main goal being to eliminate corruption and the dominance of the French colonial power. His policies were oriented toward fighting corruption, reforestation, averting famine, and making education and health real priorities. The coup that saw him claim the presidency was organized alongside his then comrade, Blaise Compaore, whom he had befriended during their military training. He is commonly known as “Africa’s Che Guevara” which really is fitting for him with regards to his personality and political ideas. Thomas Sankara was greatly inspired by the Cuban revolution. 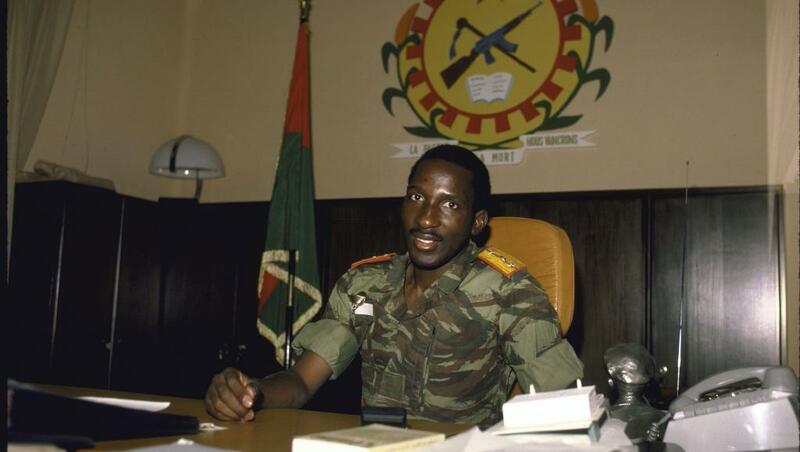 Surprisingly, the counter-coup in October 1987 that led to his death was led by his “friend” Blaise Compaore who had now turned against Sankara’s ideas. Of course he quickly denied any involvement in the assassination and by the evening of Sankara’s death he became the president. Thomas Sankara believed that anyone who wasn’t an African didn’t have much knowledge on the continent and therefore couldn’t dictate how an African country was run. He was referring to the French who had colonized Upper Volta. In one of his speeches he said, “Our country produces enough to feed us all. Alas, for lack of organization, we are forced to beg for food aid. It’s this aid that instills in our spirits the attitude of beggars.” He believed that Burkina Faso and Africa in general has the ability to be self-reliant and not rely on foreign aid. He therefore fought hard to rid his country of the influence of the French. Sankara advocated for the local production and consumption of locally-made goods and instilled in his people the belief that they could solve their food and water scarcity problems through mobilized self-sufficiency. Many of Sankara’s foreign policies were largely focused on anti-imperialism. He blamed the imperialism and the foreign companies which made profits with Africa, denying its development so that they can keep selling products to a continent which could be self-sufficient. Sankara believed that education and health should be highly valued and so he ensured that his people had the best of these. He launched a nationwide literacy campaign, and families were ordered to have their children vaccinated. This was after some families had denied their children vaccination due to cultural and religious beliefs. In 1984, Sankara’s government organized the vaccination of almost 3 million children in a little over two weeks. The Burkinabe government was also the first African government to claim that AIDS was a major threat for Africa. He also championed environmental conservation with tree-planting campaigns and greening projects. According to Ernest Harsch, author of a recent biography of Sankara, Burkinabe built for the first time schools, health centers, water reservoirs, rail, with little or no external assistance. Thomas Sankara was one of the few leaders who believed in equal rights for all. One of his famous quotes was that “The revolution and women's liberation go together. We do not talk of women's emancipation as an act of charity or out of a surge of human compassion. It is a basic necessity for the revolution to triumph. Women hold up the other half of the sky.” He therefore made policies that ensured that women were also included in the governing of the country and not be given the back seat. His government included a large number of women and he also ensured they were afforded opportunities to go into careers that were mostly considered for men. Improving women's status was one of Sankara's explicit goals that were unprecedented in West Africa. His government banned female circumcision, condemned polygamy, and promoted the use of contraceptives. One hindering factor in present day Africa is corrupt leaders. Thomas Sankara believed that leaders and those in high posts were just the same as nationals living in the rural areas. He believed that even he as the president did not deserve any perks by virtue of his position. Sankara cut minister’s salaries and perks starting with his own and lived in the same brick house that he had lived in previously. He believed that no one was above farm work, or graveling roads–not even the president, government ministers or army officers. Even individuals who held the highest posts were required to work in local community development projects. Many have said that Sankara’s death is an example of failed chances in Africa. However he remains an inspiration to many; he serves to remind us that we do have the power to unite Africa and move it forward. A week prior to his death, Sankara addressed people and said that "while revolutionaries as individuals can be murdered, you cannot kill ideas." Although, this great leader is no longer alive to come up with more ideas that could see the African continent flourish, his ideas and principles live on.